Finding the right router is often a difficult task. It’s even more difficult if you’re looking for one that can help relieve you of the lag you face while gaming. Such routers are easy to find only on the endless lists on the internet shouting on each list that a different router is a clear winner in all of them. While a lot of routers make that list, none do as much as the D-Link DIR 890L. This beast of a machine with 3 bands used for communication and powered by an 802.11ac standard with beamforming technology feels to be just great, placed in your house. The many features that power this extremely elegant looking and yet powerful as a beast, device, are necessary for any gaming router to have which along with the speed provides a stable connection, wide range and a plethora of settings to choose from to make it a must-have router. Adding Advanced Quality of Service or (QoS) to the mix and the smart network traffic monitoring and sorting algorithms running on it easily prioritizes the many services running on it like gaming, VoIP calls, video streaming etc. Fuelled by next-gen technology: While keeping your home connection top notch, the SmartConnect technology keeps the overall performance of your Wi-Fi network as brutal as possible. 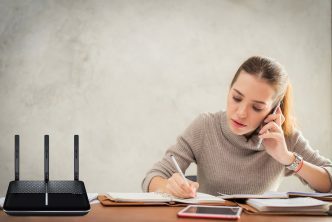 While the old devices are meant to slow down the connection due to the older 802.11 standards running on it, SmartConnect makes sure to allot them an entirely different frequency to keep them off from slowing down the network. This lets your wireless devices to reach the speed range of up to 3200Mbps. The SmartBeam technology, on the other hand, keeps the coverage of the Wi-Fi connection maximum and helps to vastly increase the speed too. 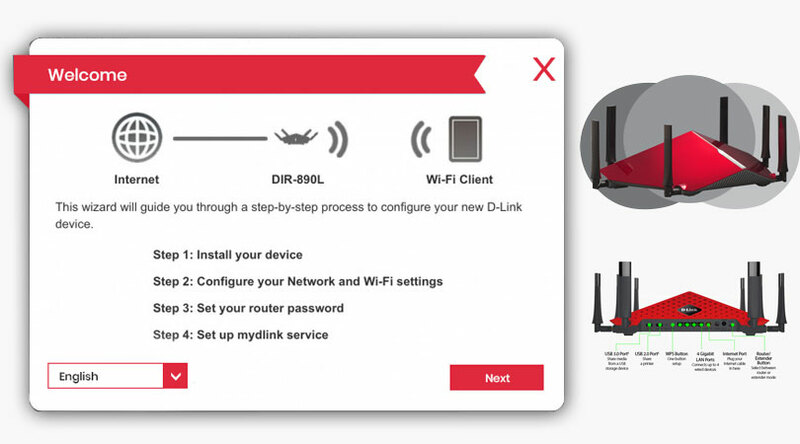 Keep an eye out on the network: Your 890L device is powered by the ability to be connected to the mydlink cloud. This allows you to make changes to your network even when you’re not connected to your home network. It also gives you a huge control over the traffic flow and lets you choose who can or cannot get on your Wi-Fi network. You can choose which site to access and which ones to block. Any PC, smartphone or tablet connected to the internet can let you make these changes. Share files at unbelievable speeds: With the presence of mydlink SharePort app, you can easily connect a USB powered storage device and share files and documents with unbelievable ease with anyone present on the network. A smart TV accessing the Wi-Fi network can also let you play movies on it with the presence of mydlink SharePort. Set it up with ease: Even with the presence of these wide ranges of features, you can still set it up easily using the QRS (Quick Router Setup) app on your mobile, tablet or smartphone. All you need to do to set it up is plug in the app and start the setup process. This allows you to basically set up an intricate piece of technology without even powering up your PC. As mentioned before, setting up the 890L is a fairly easy task. Before however starting with the setup, let’s have all the cables connected to the right ports of the device starting with the power cable. Connect the power cord to the power port of the router then plug it into a power source. Next, connect the device to the WAN using the internet port. Take an Ethernet cable and plug one end into the LAN port of the modem and the other in the Internet port of the router. You can now start the Setup process. Step 1: To setup, the device with a mobile app, download the QRS mobile app from the iTunes store or the Google Play store. Step 2: After the mobile app has installed, we will start with the setup of the device by first connecting our mobile device to the wireless network. The information about the SSID and password would be available on the Wi-Fi configuration card of the router. Step 3: Launch the QRS app after connecting to the wireless network. Step 4: Press next to start the configuration process. Once you find yourself on the naming of the SSID networks for both the 2.4 and the 5GHz bands of the router. Enter the SSID name and choose a password for the same. Step 5: Next the app will ask you to choose a device password which will give you access to the configuration settings of the device. Step 6: Next the app will ask you to login to your mydlink account. If you have one, simply log in with the username and password but if you don’t, you can easily make it with the steps provided once you select ‘No, I want to create a new mydlink account’. Step 7: The app will now ask you if you wish to know about the new firmware updates to keep your device updated with the latest software. It is recommended you activate this option. Step 8: All the setting you chose will now be available for you to look at so you can go through them one last time. Press next to complete this step. Your device has now been successfully set up. How do I setup Asus RT-AC86U?